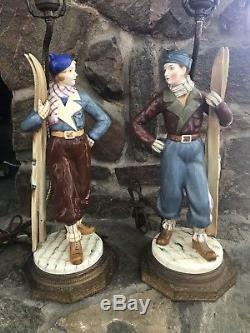 Rare and wonderful pair of vintage c. 1920/s1930s hand painted ceramic lamps by Goldscheider Keramos of a man and woman skiers posing with their skis and dressed in skiers costumes. Perfect ski lodge decor for your Aspen, St. Moritz, Sun Valley or Cortina dAmpezzo hideaway. They are French mounted with curved and artistically hand patinated twisted and decorative metal standards, and also pristine and completely original, not a marriage. In storage for decades and estate fresh. The figures are sitting atop embossed and filigree reticulated metal stands and the cloth wiring is old and would need replacing. The original green felt underneath the bases is original and untouched. Each is painted in great detail and are in excellent damage free condition. There is a teeny tiny flake/nick to the glaze on one of the skis, and I do mean teeny, and only mentioned for the sake of complete accuracy. Height including original harps is about 26.5. Perhaps a little looseness to standards can be remedied when rewired. Ceramic height is about 14. Please ask questions before purchasing and thank you for looking! The item "Pair of Art Deco Goldscheider Keramos Hand Painted Porcelain Lamps od SKIERS" is in sale since Wednesday, May 23, 2018. This item is in the category "Antiques\Decorative Arts\Lamps". The seller is "avantione11" and is located in Spokane, Washington.